1 of 1 Prepare outdoor grill with hot coals, or heat gas grill to hot, or heat oven broiler. 1 of 1 Whisk together peanut butter, oil, lemon juice, soy sauce, red-pepper flakes, garlic powder and ginger in small bowl until smooth. Slowly whisk in warm water until good dressing consistency. Cover. 1 of 3 Brush both sides of chops with soy sauce. 2 of 3 Grill or broil chops 4 minutes. Turn over and cook another 3 to 4 minutes or until internal temperature registers 160 degrees F on instant-read thermometer. Set aside; keep warm. 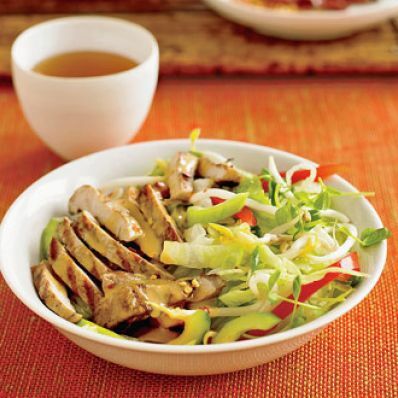 3 of 3 Toss together lettuce, cucumber, sprouts, sweet red pepper and scallions in large bowl. Place on large, deep oval platter. Slice pork very thin; fan out on salad. Top with fried onions, if using. Serve with dressing. Makes 6 servings.